Re “Class Warfare” by James O’Toole (Winter 2012): Born in East Boston in 1904 and one of 11 children, my father, Paul Grattan Kirk, graduated from Harvard College and Harvard Law School. Although he had a lifelong loyalty to his alma maters, he was also a faithful Catholic with a deep, dignified pride in his Irish heritage. At the time of his appointment to the Massachusetts Supreme Judicial Court, in 1960, most of the other justices were also graduates of Harvard College and/or Harvard Law School, and all of the coveted jobs as law clerks went to Harvard Law graduates. My father believed that fundamental fairness required that the other fine law schools in the area should have their students placed in those prestigious positions too. During his 10 years on the court, the majority of the clerks he selected came from Boston College Law School. He greatly appreciated their scholarship, friendship, and loyalty. I am certainly no apologist for poor behavior by Harvard (my alma mater). But would Boston College, Holy Cross, and Georgetown be the world-class institutions they now are if they had not adopted the college and elective course structure—and, frankly, if they had not all slowly moved away from being “Catholic” institutions? Timothy Brosnahan, SJ, was my grandfather’s brother. Knowing only that Father Tim had been president of Boston College, I presented myself on campus in the fall of 1952 (and went from there to Harvard Law School). The tradition of providing a college education to emerging immigrant families and their successive generations was never more helpful than in my own case. When I stepped on the Boston College campus, I sported a high school average of D–. All of my teachers but one during my four years on the Heights were Jesuits. It was there that I learned I could think. “Class Warfare” was thoroughly enjoyable, but I have a trivial question. The man in the lower right corner of the cover photo is balancing a book between his arm and knee. What is it? The answer may never be known. The resolution of the image, which is from 1899, is insufficient for deciphering the title. Re “Oral Argument” by Thomas Cooper (Winter 2012): I am not the least bit surprised that the British government has cited a treaty with the United States as the basis to demand the release of the interviews of two former Irish Republican Army members. The Brits stole Ireland fair and square, so why not the evidence as well? Today I teach, and whenever I need reminding of what I’m capable of doing, or lose sight of the kind of man I’m supposed to be, I dial up that memory to bring me back on track. I choreographed musicals at Boston College for four years, the last one being Camelot with Gordon MacRae in 1981. It was a wonderful, exciting opening night—TV stations lit the sky, a formal affair. Alumni were invited back to perform, including my daughter Lisa Fichtner Pratt ’80. Choreographing Gordon MacRae was fun; he told stories of his good friend Bob Hope and how they loved to dance the “soft shoe” together. I remember hearing those stories recounted during our directing class with Dr. Hecht. Along with the many others told by our professors, they have become part of a shared history. “Stage Presence,” a slideshow of scenes from the first 121 productions performed on the Robsham Theater main stage can be viewed on BCM’s multimedia website @BC. In “The Collector” (Fall 2011), Andrew Nelson mentions living in the Bristol County Jail on Ash Street in New Bedford, Massachusetts. 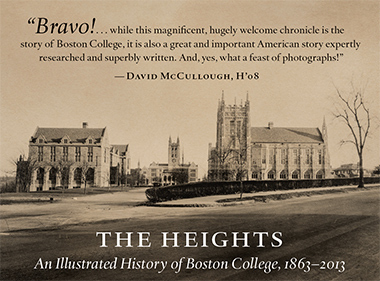 In one of those Boston College coincidences, I also lived in that house, from 1962 to 1983, as did my brother Ron ’92. When our father retired as sheriff of Bristol County in 1983, Governor Dukakis appointed Nelson’s father sheriff. As I am sure Andrew would say, living in a jail complex was an interesting way to grow up. Re “Visitors Days,” by William Bole (Fall 2011): Has Boston College forgotten that invasion of sovereign countries constitutes a war crime? Has anyone at Boston College challenged guest speaker Colonel Michael Meese to use his considerable talents to promote life for all people? Re: “Master Teachers” by William Bole (Fall 2011): As an instructor, Diana Pullin was ever inquisitive, probing, and challenging. She pushed me beyond what I thought was intellectually possible, and I owe much of my professional and personal growth to her prodigious care. The writer works in academic program development at the University of California, Los Angeles. We were saddened and surprised to read in “Data File” (Fall 2011) that the class of 2015 has only three commuters. Fifty years ago, the University was made up almost entirely of commuters. Those who did not commute rented rooms in nearby homes. No doubt Boston College has changed greatly, and mostly for the better, but eliminating commuters entirely moves the University far from its roots and breaks the historical bonds it had to the surrounding neighborhoods. To those three members of the class of 2015, know well that thousands of Boston College grads happily attended as commuters over the years. They commuted to save money, to continue working at part-time jobs, or to care for brothers, sisters, or others at home. Not only will you three save many thousands of dollars in the cost of your education over the next four years, but if present economic conditions continue you can be assured that many of your classmates will be moving back in with their parents soon after graduation. “Head First: A Defense of Optimism” (Fall 2011), drawn from Colum McCann’s academic convocation address to freshmen in September, was outstanding and inspiring. Thank you. As my charismatic professor for The History of Boston, Blacks in Boston and an independent study of Boston’s 10th Congressional District, Andrew “Doc” Buni (1931–2012) became my friend and no-nonsense mentor. He introduced me to his heroes (Paul Robeson, W.E.B. DuBois), interests (straight-ahead jazz), and friends (his colleagues Carol Hurd Green, Amanda V. Houston, and others), whom I in turn made my own. Encouraging me to “make” and “teach” and not just “study” American history, Doc proudly endorsed my appointment to teach Eyes on the Prize: U.S. Civil Rights History at Boston College when I was hardly through with my master’s program, and he cheered for me —”Go get ’em, kid!”—on many instances after that. John Romeo was the man we all want to be or want our daughter to bring home. He was honest, caring, and always loyal. I miss him, and Boston College will miss him. God bless his family.